Take I-77 south out of Cleveland, then take exit 147 to Miller Rd. toward VA-21 in Brecksville. Turn left onto Miller Rd., then right onto Brecksville Rd. Turn left onto Snowville Rd. and continue for about 3 miles, then turn left onto Riverview Rd. Turn right onto Vaughn Rd and continue onto West Highland Rd. Finally, turn right onto Brandywine Rd, and the destination, 8176 Brandywine Rd., will be on your right. Take Rt 8 north out of town. Get off at exit 14A towards Boston Mills Rd & Hines Hill Rd. 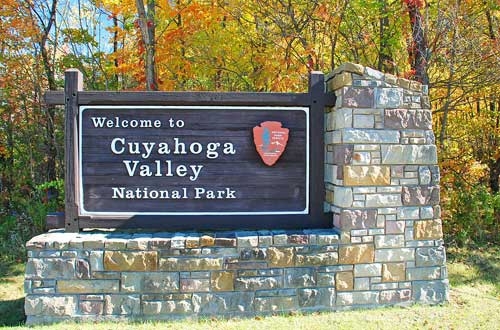 Turn right onto East Boston Mills Rd, following signs for Hines Hill Rd and the Cuyahoga Valley National Park). Turn right onto Olde 8, and finally, take a slight left onto Brandywine Rd. The destination, 8176 Brandywine Rd., is on the left. Head west out of town on West Streetsboro St. Turn Right onto West Boston Mills Rd and continue for 3 miles. Turn Right onto Olde 8, followed by a slight left onto Brandywine Rd. The destination, 8176 Brandywine Rd., is on the left. The Falls are accessed from the parking lot on Stanford Road, just off Brandywine Road in Sagamore Hills. A wooden boardwalk leads from the parking lot to the Falls. What do we do when we're there?